We’ve had several conversations here on DealerRefresh about dealers blocking Facebook from employees in fear of low productivity. At one point there was a study that showed where over 50% percent of companies block social media in the work place. That stat was from a study in 2011. I’d be curious to know if this percentage has changed any over the last year or so. If you know of a recent study with this data, please share in the comments. Either way, no matter how you define your dealers social media strategy, lets agree that playing on Facebook, or the internet all-together isn’t part of it. I for one have never supported blocking social media from the employees at the dealership. I believe everyone would be treated like an adult until otherwise proven they can not conduct their urges to use the internet at work for non-productive items (within reason). Let’s be real, how many of us haven’t huddled a staff desk to watch a gut busting video on YouTube? Is social media hurting your productivity at work? Are you Facebooking during work every day? If so – whats your percentage of personal vs professional? Should casual social media be STOPPED at the dealership? I think that most employees check their Facebook & personal sites on a regular basis throughout the day. I know I’m guilty of that. 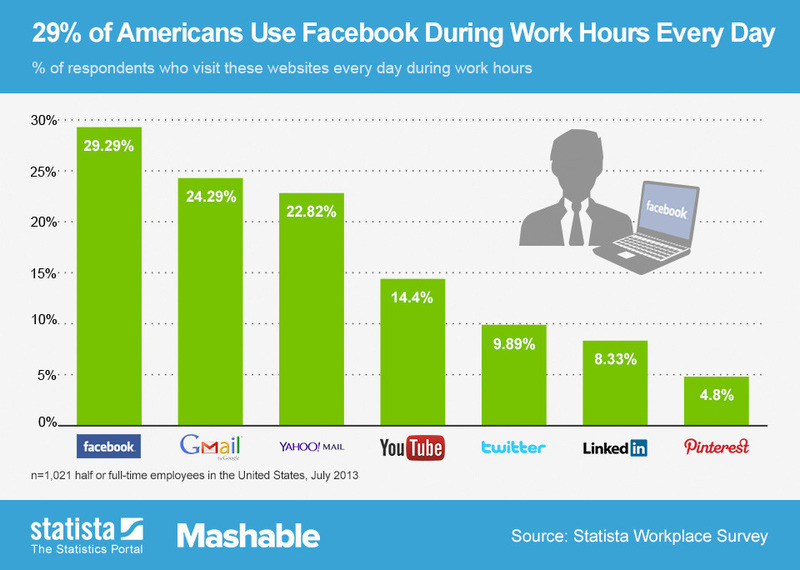 I’m surprised they are only saying 30% of employees use Facebook during business hours. I would think that number would be higher with all of the smart phones, tablets, ect. I think social media can be a great selling tool that lets face it….not many salesman utilize. I would never recommend it being blocked at a dealership but I do understand why some companies still do block it. (Most of the time I find those companies don’t have a strong presence on social media & don’t see the value in it, but then again not many dealerships do it right!) I don’t think Facebook stops my productivity at work however, I do see how it could effect some people. Blocking Facebook or any other social sites can actually do more harm than good in my opinion. I actually encourage the use of any and all social media. This is a great time for me to teach sales folks the proper way to tag our dealerships on a platform level. For the bold ones I teach how to set up listening channels and proper hashtag usage. It helps bring down the costs of paid advertising and helps drive the earned and owned segments. It isn’t something that should be forced upon or taken away. But rather trained, explained and encouraged. You can block it from your employees at work but it’s not going to stop them. They’ll just pull it up on their phone. I say embrace and train your people how to leverage it for personal branding to potentially sell more cars. dealerrefresh Agreed!! They will do it no matter what, might as well promote best practices &helpful hints on what may help them use it as a selling tool. We fought this battle in the past, and Facebook was blocked on our networks. The first to complain were our customers who accessed our wi-fi, so we opened the wi-fi to social media. Then the sales reps just bypassed their direct network connections and used the wi-fi to get to Facebook. Where there is a will, there is a way. We start blocking tomorrow at our dealership. I will let everyone know how it goes. AutoLawJD dealerrefresh – My guess is that isn’t listed in their job description, though. i would answer, but i’m too busy at work on facebook. lol. KevinFrye I agree with you. I think anyone who can should be sure to attend Kevin’s session. I think this is an area where education will trump regulation. Michael Rodriguez What caused the move to block? my company HP does block facebook, and email services. Michael Rodriguez JessicaRuth That’s usually how it happens – a bad month creeps up and there “needs” to be a reason for it. It’s gotta be because everyone is spending time on facebook. I can hear the GM complaining now. dealerrefresh Michael Rodriguez JessicaRuth They always over react…You would think someone might be like hey maybe everyone else’s employees might be on facebook too….just saying. They will still do it…just a whole lot more phone action. It’s a lot higher than 30%! Sarah Udelhofen dealerrefresh Michael Rodriguez JessicaRuth Exactly – it’s not just unique to your store. Nothing you can or should do about it. Many sales are made through friends and connections. Also as a sales person you spend more time at work than at home with family. Idle down time cannot alway be spent “calling”. People dont pick up, andd the dont answer emails. BUT they do read a push notification with in 3 minutes or less. Be APP solute is a tool the dealership can purchase for $1500. All communication can be done through this APP. Service Departments can really benefit from an APP. Unlimited texting, ecommerce, GPS, fan wass, share with all social media, so much more. Who interested in their customers don’t have $1500. All the comments I am reading are mentioning the smart phone. Well tap into it and don’t get left behind. LOL we are all on Linkedin right now!!! Are you at work?